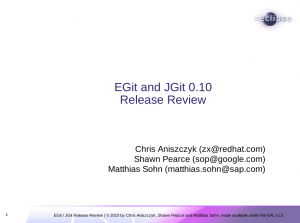 The EGit and JGit teams are happy to announce the 0.10 release, just in time for the holidays! I’m happy to say we got a lot done for the 0.10 release. In JGit (new and noteworthy) we improved performance, improved the API and added HTTP basic and digest authentication which should help people behind firewalls. In EGit (new and noteworthy) we added a merge tool, UI for new JGit API (cherry-pick, notes, pull, rebase) and improves the Repositories view. On the whole, it’s been a long journey since we brought EGit and JGit to eclipse.org earlier this year. Since our first release in early March, we’ve had over 1500 commits and added 5 new committers to the projects. The project has wide support from individual contributors and companies like Google, Red Hat, Tasktop and SAP. While we are still in beta and appreciate the patience of a variety of open source communities, we’re confident we can ship 1.0 in time for the Eclipse Indigo release in June 2011. Next up, we plan to ship 0.11 in late Feburary 2011 in time for the Helios SR1 release. If you want to help us get to 0.11 and 1.0, please try out the tooling, file bugs and contribute code if you have the time.